Eight years on from the original, GONE IN 60 SECONDS 2: THE JUNKMAN (As it was known pretty much everywhere outside the US) was a vastly bigger budgeted exercise in fender-bending. Whilst boasting a couple of the greatest auto stunts ever filmed, including a car flying OVER a plane, the film does not have the rawness of the original that made it the unique experience in auto-wrecking it was. They even managed to get Lynda Day George and Christopher Stone on to the pay roll! The “chase” this time sees Halicki being pursued by two hitmen and one slinky and mega-cool hitwoman with designer handguns. Much of the car crashes are obviously deliberate and lack the spontaneity of the ’74 flick. 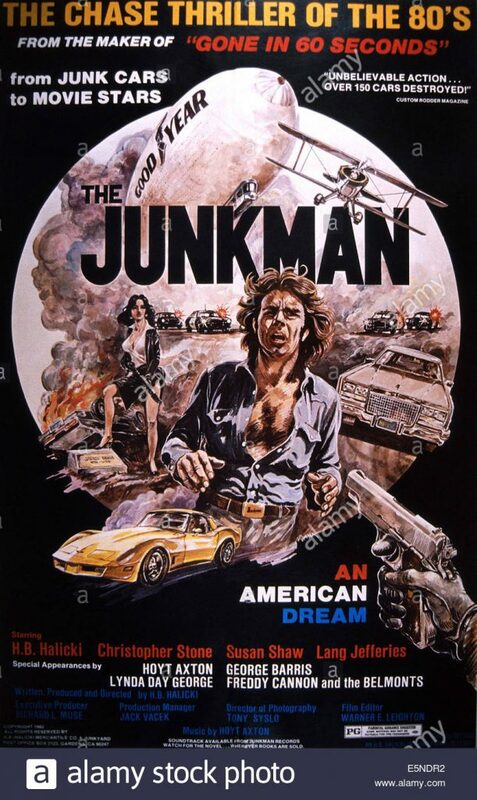 However the scene wherein Halicki tosses a live grenade over his head on to the guy behind him that blasts the Chev right over Halicki’s Caddy, is the one to watch for. Ive never seen better in any action movie. Heaps of reminders of the original in terms of posters and even a premiere for GONE IN 60 SECONDS. We are even privileged to see the original “Eleanor”….the crushed and battered yellow Mach 1 from the original movie (that Halicki kept for years as his most prized possession!) It infuriated me that Nicolas Cage was permitted to use that name for his Shelby Mustang in the 2000 remake, of which the less said, the better. It could never be anything but Harlan’s! For those of you who do not know, H B Halicki died doing what he loved best in August 1989, attempting an auto stunt for a sequel to GONE IN 60 SECONDS that was never completed. Doubtless he is in his element somewhere in that great garage in the sky!